The Urban Herd(s) continue to expand their territory and are becoming an increasing menace on the streets. 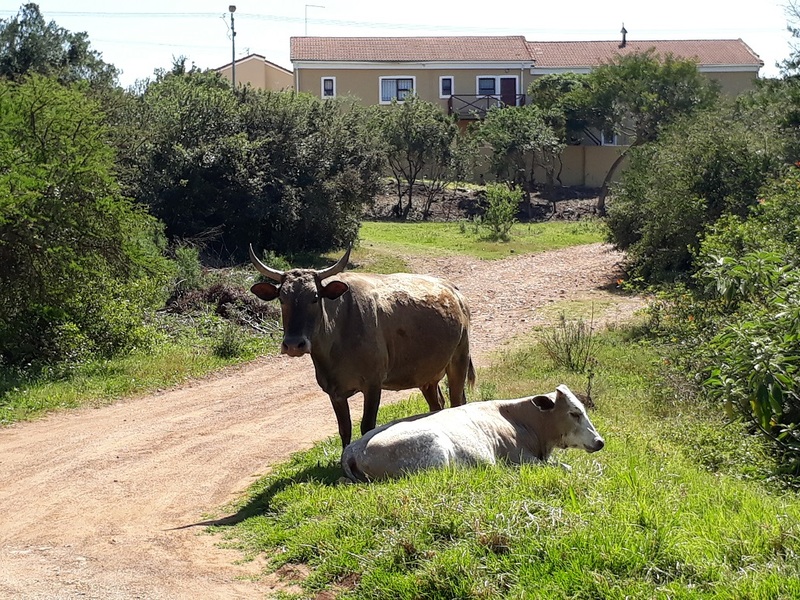 These cows are making short work of the Strelitzia growing on the verge opposite my back gate. 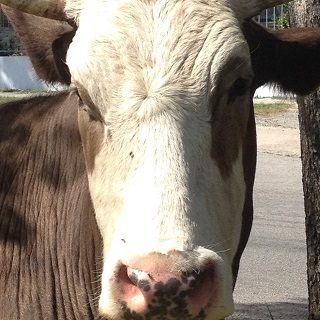 This is one of the same herd that has moved further along the street. 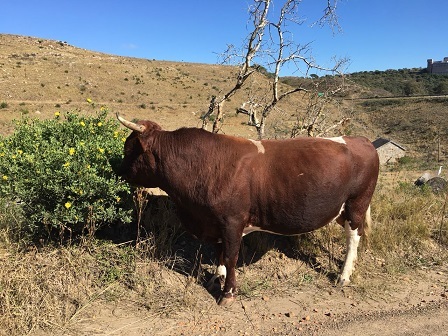 A fine looking bull is browsing on a Bitou bush next to the road on the edge of town. 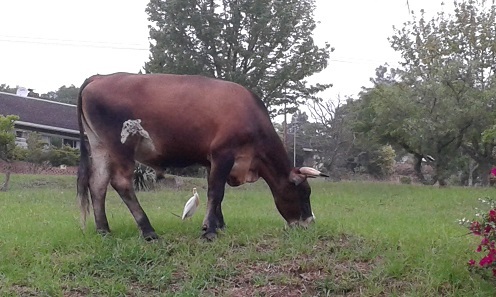 While driving through a less salubrious part of town, we came across this cow and its attendant Cattle Egret – it is easy to see why the cattle prefer private gardens and school sports fields! 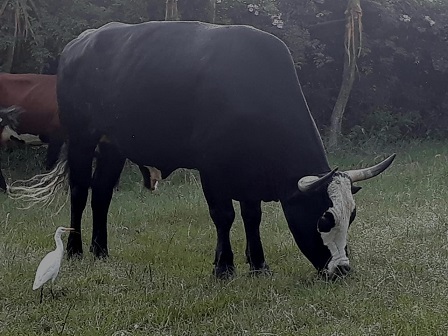 This is in sharp contrast to this one grazing on a grassy verge in the suburbs – also with a Cattle Egret in attendance. 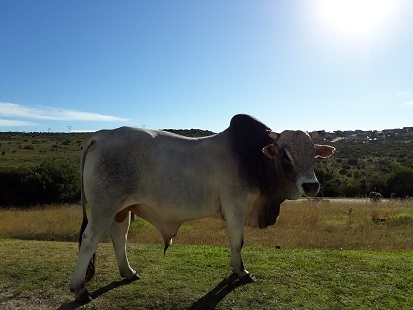 And this healthy looking bull just off the highway, on a ridge overlooking town. 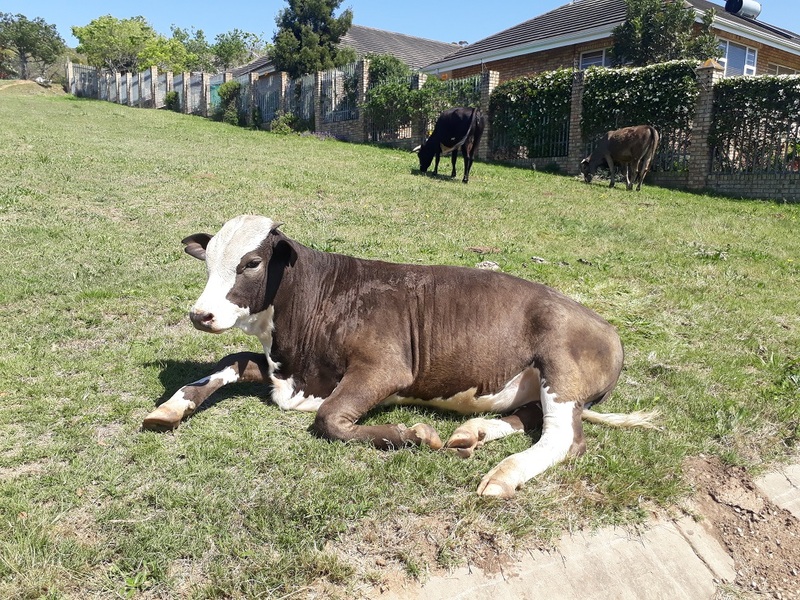 Our latest tally whilst driving through town recently was four herds of cattle that together totalled over sixty head – all in an excellent condition. 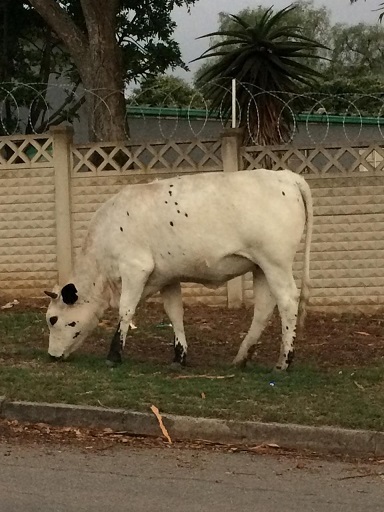 The Urban herd has become an unstoppable phenomenon we have to be on a constant lookout for. 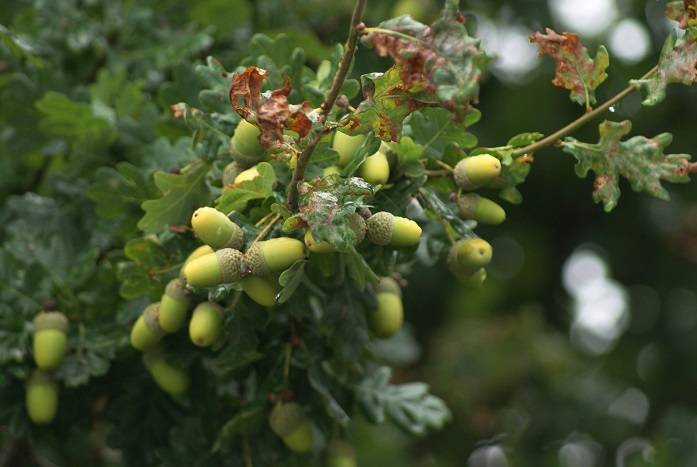 Although oak trees, many of them English Oak, can be found in a number of South African towns, they are not indigenous to this country but originate from the early European settlers, who tended to plant what they were familiar with. It is believed that many of the oaks in parts of the Western Cape probably originate from trees imported by the Dutch East India Company as a source of wood for the manufacture of wine casks. Under the right climatic circumstances, oaks have a life expectancy of between 300 – 600 years and so it is not surprising to find mature oaks still growing in a number of the older towns and cities in this country. 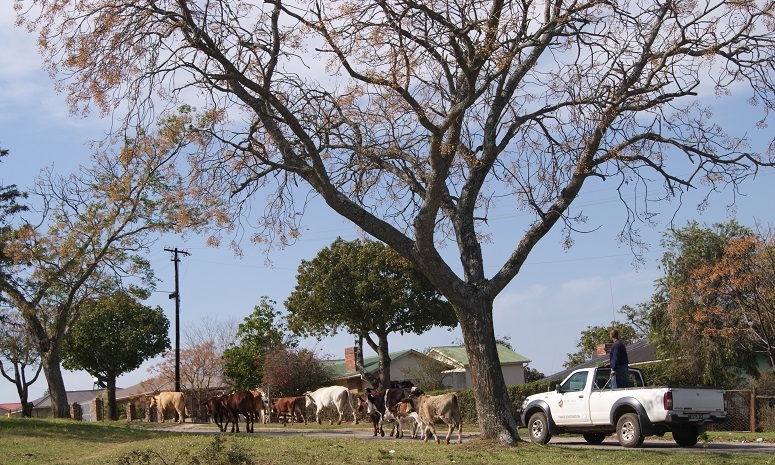 Our little town, established as a military post in 1812, still has a number of streets lined with oak trees – what stories they could tell of the changes that have taken place over the past two centuries! 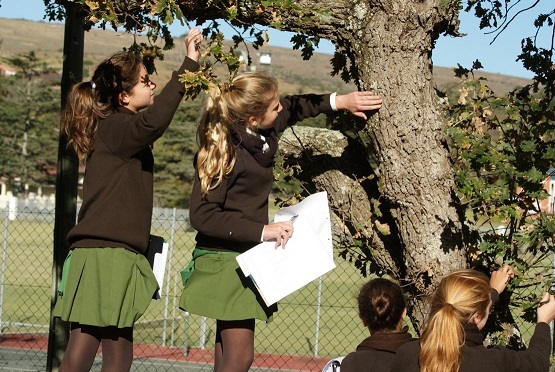 Here a group of schoolgirls is inspecting a relatively young oak tree growing next to the tennis courts on their campus. Not all of the oak trees are old – saplings abound, many of which have been left to grow into mature trees. There are even the odd oak trees growing next to the roads, possibly remnants of deliberately planted trees or ‘escapees’ that found favour in the soil. We are used to the presence of oaks and love them for what they are. 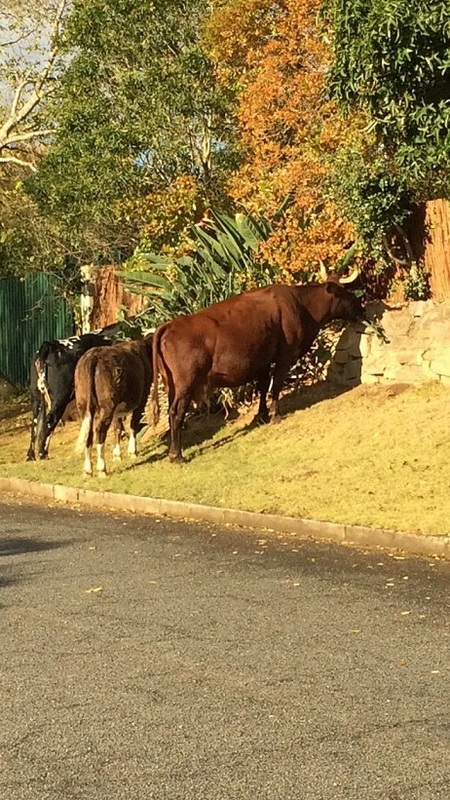 The Urban Herd, which regular readers will be familiar with by now, continue to wander through the suburbs at will – munching on the grass verges, as well as any flowers, shrubs or leafy plants they can reach. I watched some of them doing just that and was surprised by the odd loud crunching noises, until I realised they were eating the acorns that had fallen onto the pavement! 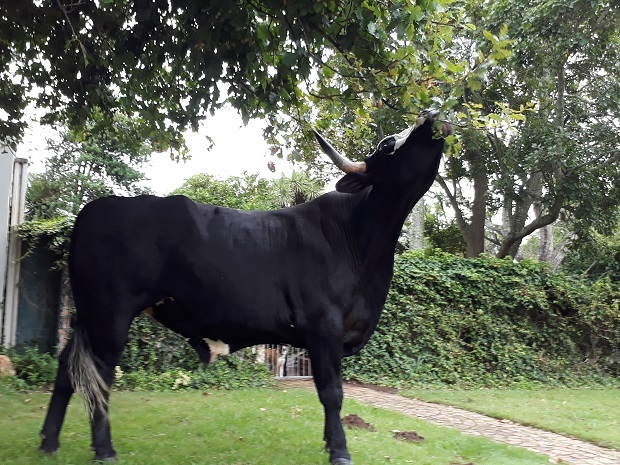 A little further on, I spotted this bull – which we have dubbed ‘The New Year Bull’ – reaching up to pull clusters of acorns from the trees. 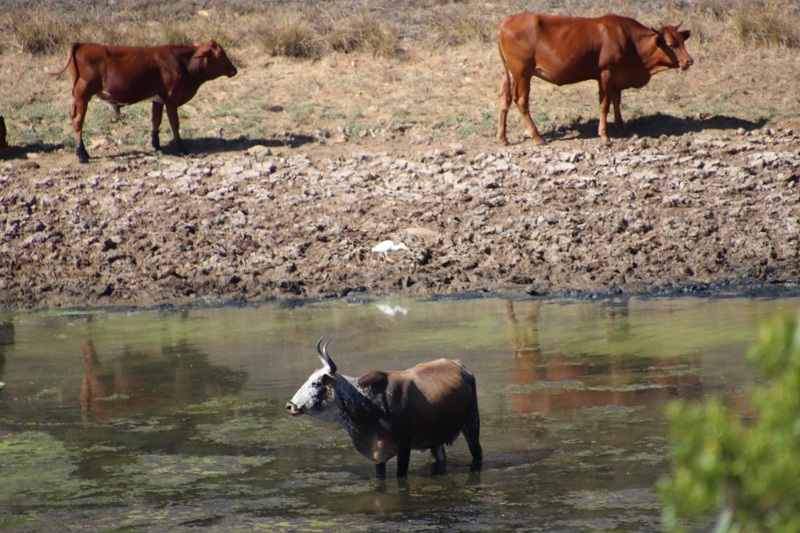 We have become so accustomed to seeing herds of cows, bulls and calves all over town that we can recognise individuals by the patterns on their hides, the curve of their horns or simply by association with each other. 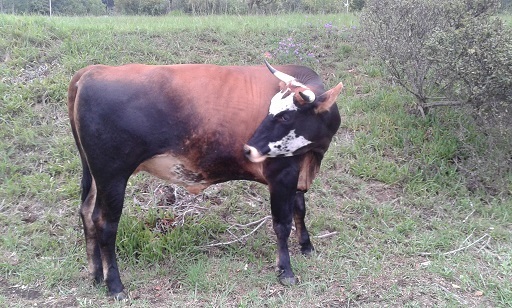 Thus, there is The New Year Bull’s herd, the String Bull, the Golden Cow, Caramel Cow and so on. 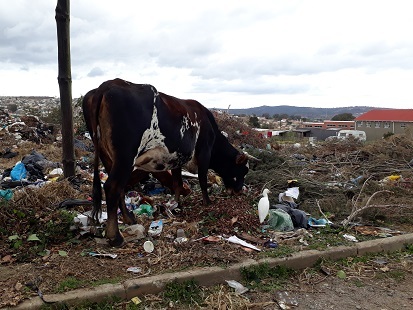 Efforts to have the livestock removed from the urban areas have proved to come to nought – the animals are back within a day or two. 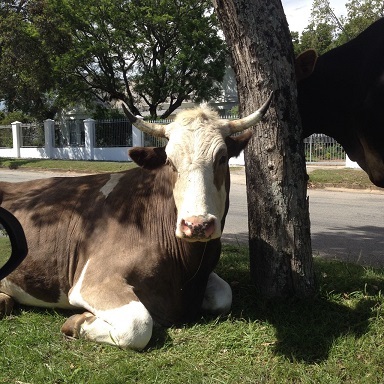 It was with some concern then that I heard loud mooing coming from lower down the hill where we live the other day. It sounded frantic and came from more than one animal at a time. Had someone driven into them on the road? That is always the danger. 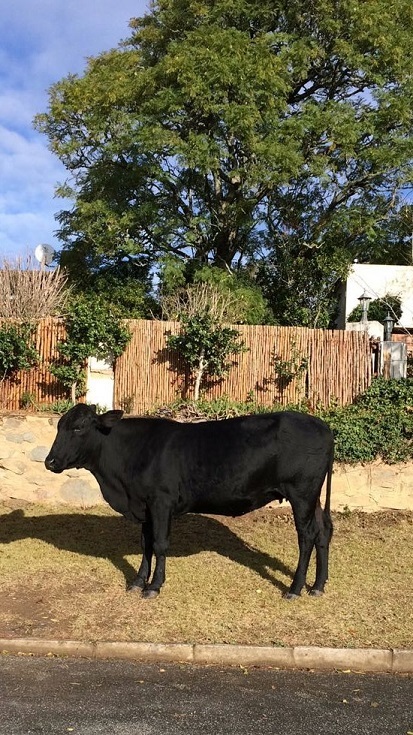 Only the other night motorists had to come to a halt in the dark as there were black cows standing in the middle of one of the main streets in the suburbs. I peered out of my gate. The small herd that I could see were on the trot and mooing as they did so. See their tails raised and their quick gait. Then I saw two men shouting at them from behind and waving long sticks. They were really too far away to be very effective – until a municipal tractor arrived to drive alongside the animals, the driver too adding to the cacophony. The animals had been interfering with traffic near the bottom of the hill – a busy part of town now that the schools and university are operating again after the summer holiday. I can just imagine the order, “Get them out of here, anywhere, just get them away from here!” The hapless men were not going to extend themselves. Why should they? By afternoon that same herd was back grazing on the lawn below our house! 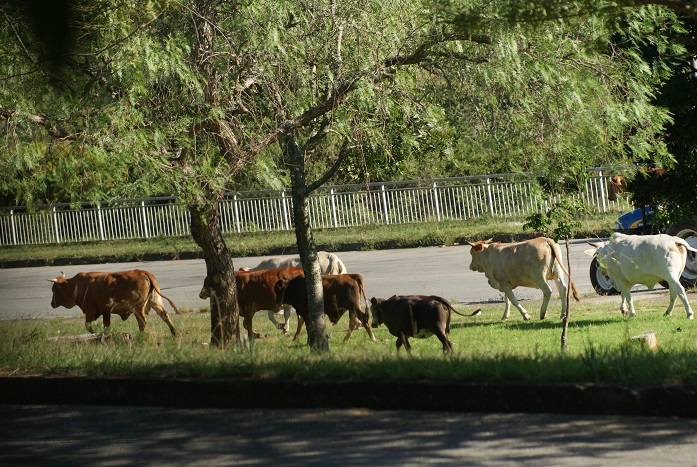 Having seen cattle grazing in various places in town this morning, I was rather surprised to see this section of the Urban Herd hoofing it up a steep street, urged on by a municipal truck! The man on the back was wielding a stout stick which he banged on the side of the truck from time to time. 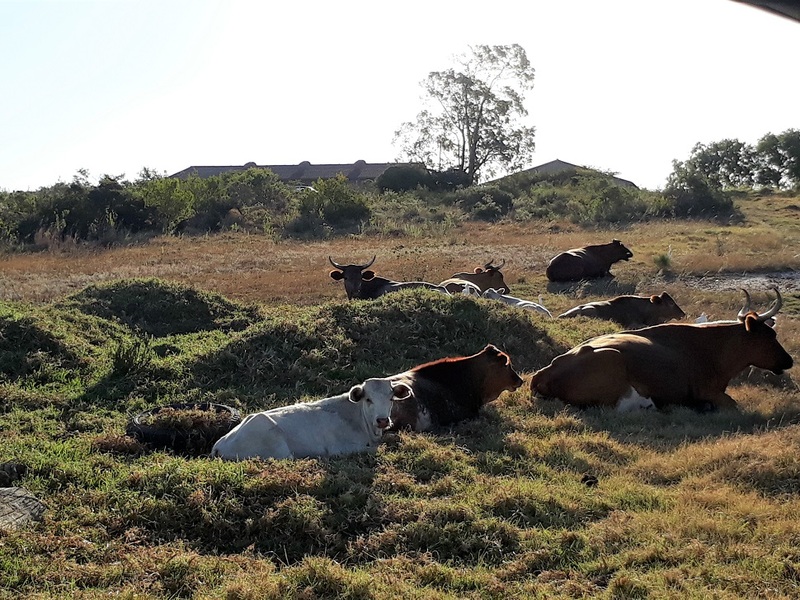 Only the first section of the herd is visible: at least another fifteen cows, bulls and calves were behind the truck – several straying onto an open field – doubtless they too were going to be sent on their way before long. Destination: unknown, for they are bound to be on the hoof again tomorrow! 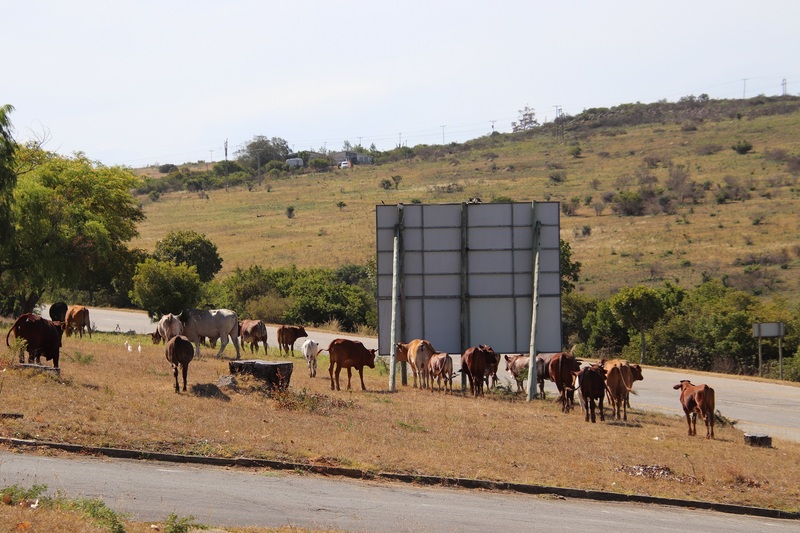 As the drought continues to bite into the countryside, the ever expanding Urban Herd fan out through the suburbs in search of anything worthwhile to eat. Their usual grazing on the commonage on the other side of town has long been grazed to the quick.